The teacher’s role is not to provide all the correct answers. Rather, the teacher provides the occasion for discovery and learning. Our approach is hands-on and multi-sensory. We recognize that children have a natural curiosity and a predisposition to enjoy the unexpected. 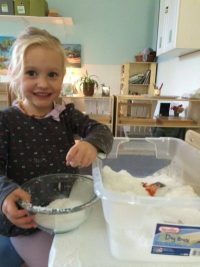 Children engage in active exploration and investigation to make sense of their world. We strive to fuel children’s investigative impulses and encourage discovery, promote questioning and challenging of ideas, and formulate connections of experience. We are the stage directors; curriculum is teacher’s responsibility, not children’s. People who hear the words child-centered curriculum may wrongly assume that everything simply emerges from the children. The children’s ideas are an important source of curriculum but only one of many possible sources that reflect the complex ecology of their lives. Teachers are encouraged to spend time observing as one method of assessment. When she sees that a child has mastered a skill or a concept, she will know to offer a new challenge or present the next lesson in sequence. If a child is struggling, she may offer assistance or represent the lesson.